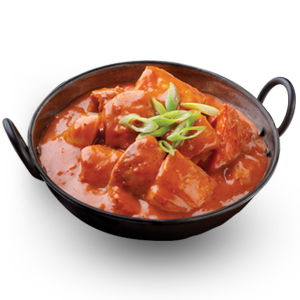 Butter chicken is an Indian dish of chicken in a mildly spiced curry sauce. The dish has its roots in Punjabi cuisine and was developed by the Moti Mahal restaurant in Delhi, India. The chicken is usually cooked in a tandoor. Garnishes can include butter, cream, green chillies, coriander, and fenugreek.